Drew Hayden Taylor grew up and still lives on the Curve Lake First Nation (Ojibway) in Central Ontario. A writer of many disciplines, he is honoured to be considered a contemporary storyteller. From “Concrete Indians” by Anishinaabe/Ojibwe photographer Nadya Kwandibens. Every few years, almost as constant as Halley’s comet but a bit more frequent, the topic of cultural appropriation regarding the Indigenous community rears its ugly head. Years ago it was in response to W.P. Kinsella and his Hobbema stories. Since then, everything from Johnny Depp portraying Tonto to Germans holding faux powwows incites another variation of the discussion. Briefly put, the discussion involves the right or ability of people from one culture to write or capitalize on another culture. For as long as I’ve been a professional writer, cultural appropriation always seems to be lurking in the bushes, occasionally popping its head up and creating a fair amount of antagonism for both Native and non-Native people. Lately, it has been especially virulent. In 2017, for those who were vacationing in Antarctica, the Canadian media was all atwitter (with twitter being the operative word) over several different matters regarding the appropriation of the Native voice. Much has already been written about author Joseph Boyden’s controversial and confusing claims of Indigenous heritage. Not long afterwards, the Writers’ Union of Canada magazine Write, and a supporting cast of well-educated, white, mostly male characters, discussed the need for or the case against cultural appropriation within its pages. The result was the resignation of the magazine’s editor, Hal Niedzviecki, and the topic quickly becoming a tennis ball on the court of public opinion. Those in the so-called settler community were split — some saying art is colourless and writers make things up for a living, others proposing that First Nations in Canada should have the right to tell their own stories. Inevitably, somebody will say cultural appropriation has been happening since time immemorial, and that all cultures borrow and share elements of everybody’s culture. I, myself, have been told that if I disagree with the concept, I should not express my opinions in writing or in print, both borrowed from lands across the ocean. Expanding the argument, I should not eat Chinese food or Greek food. I should not use chopsticks. Wear shoes. A watch. I shouldn’t drive my Kia or read any Tolstoy or Joyce (not that I have, but you get the point). The one that personally drives me up the wall states that if I am against cultural appropriation, I should not, as a logical extension of their argument, write in English. What these people forget is that most Indigenous people learned to express themselves in English through a metaphorical gun being held to their head. Most Indigenous writers can’t write in their ancestral tongue because it was outlawed, and we were severely punished if we tried. So now, for the most part, we write in English. Sometimes you want to tell these people to please, make up their minds. Those within the Native community are more universal in their opinion of cultural appropriation. Most equate it with a form of cultural genocide. By letting settlers tell our stories, they control how the public views us. The Native experience is filtered through a non-Native consciousness, and therefore inaccurate and flawed. 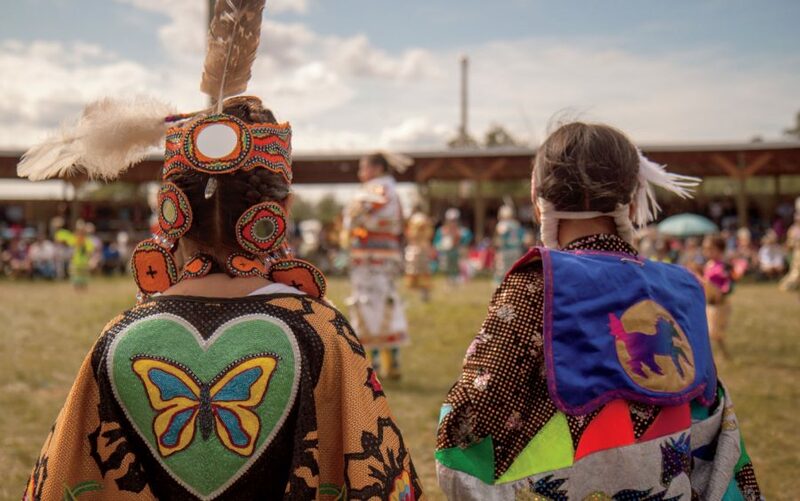 The annual powwow at Beaver Lake Cree Nation in Alberta. Yes, there is cultural mixing and matching on a global scale. That is obvious, and I do believe the world is better for it. When I find myself enjoying a bowl of pho or watching Britcoms, I don’t consider it cultural appropriation. I am fairly confident I have an ad hoc permission from both cultures to consume and enjoy the benefits of their nations. The owners of all the ethnic restaurants I — and practically everybody in Canada and the world — patronize would undoubtedly give us the thumbs up to devour some sushi or dim sum or dal. That is good cultural appropriation. From our perspective, Europeans have taken our potatoes, corn, tobacco and canoes essentially with our permission. It was traded. It is a thing. Enjoy. I am unaware of any First Nation decrying the international use of kayaks or potatoes. Okay, maybe one or two, but not collectively. I have also heard the argument from non-Native writers saying they now feel uncomfortable using Native characters in their plays/novels/video games for fear of retribution. Relax. Writers frequently represent the worlds they live in, and in today’s realm there are overlapping civilizations. I am sure Indigenous people occasionally pop up in all Canadian writers’ lives, just as non-Native people pop up in ours. I personally have no problem with Native characters appearing in the works of settler fiction. I think it’s kind of cool. In many of my works, I’ve had Germans, Jews, and generic white characters criss-cross the lives of my Native fictional creations, just like in real life. The real issue comes when writing a story from a specifically unique cultural perspective. Without permission. You don’t need permission to say you had a conversation with a Native person in a coffee shop, or dated one once in university. It happens. To everyone. So write it. But I believe you do need permission to write from the perspective of somebody who lost a child to the ’60s Scoop, or dealt with racism on the reserve. In fact, I think that requires it. There are collective cultural explorations, ones that bring joint delight and revelations to all societies. I have written both a Native vampire novel and a collection of Native science fiction short stories. Both might be considered a form of cultural appropriation — “Native people don’t have a history of vampires or space ships.” If so, I apologize to the vampire and alien communities if you think I have overstepped my boundaries. Again, I don’t believe permission was needed from any specific culture. No angry emails or letters yet from Nosferatu or aliens. There’s also the argument about how it’s a slippery slope. If you allow this, where does it stop? Do men have the right to write about women? Right-handed people write about left-handed people? Bank robbers write about embezzlers? And so on. Somebody once said, in regard to legislating laws against obscenity, something akin to, “I can’t tell you what obscenity is exactly, but I’ll know it when I see it.” But think of it as those little trays you used to see in variety stores that say “Take a penny” (back when there were pennies). There is a difference between taking a penny, and taking $200,000. Several months ago I saw an ad promoting a new item Chanel is marketing. It’s a designer boomerang. It retails for nearly $2,000. No joke.